The Walking Lead: Bring Out Your Dead! 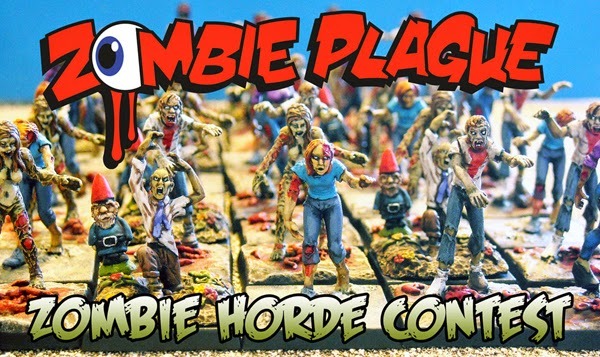 Sourcing, assembling and painting a miniature zombie horde. The funky folk at RSquared Studios know their zombies and their target audience only too well. They're offering a rotting fist full of undead lead in exchange for the gribbliest photos of your horde. Check out their Zombie Horde Contest! Beneath the apparent quiet of the Hybridhorde graveyard things have been decomposing steadily. Silent ranks of foetid horror await a final varnish before stumbling onto their urban bases and out onto the interwebs. Can't wait to see the finished articles dude. Sounds like this might be fun, thanks for sharing! No worries Zombie AD, it will be fun to see what's out there! This is a great contest thanks for sharing! Just seen the results! Congratulations dude. Well done. Great job on the Zombie Horde contest and I'm afraid I've awarded you a Liebster! I've put the details on my blog.